Day 8: I went for three me-mades today, seeing as how two of them were accessories. 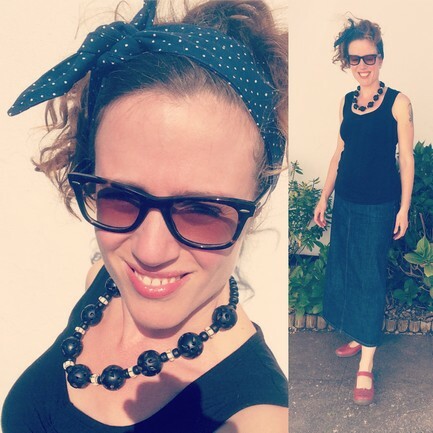 I teamed up that black Knit Sweetheart Top (second time this May) with my chunky necklace and freshly made rockabilly head tie. Really liked these together, although I did at times wonder if the head tie was giving off more of a housework vibe than the vintage glam I was after! 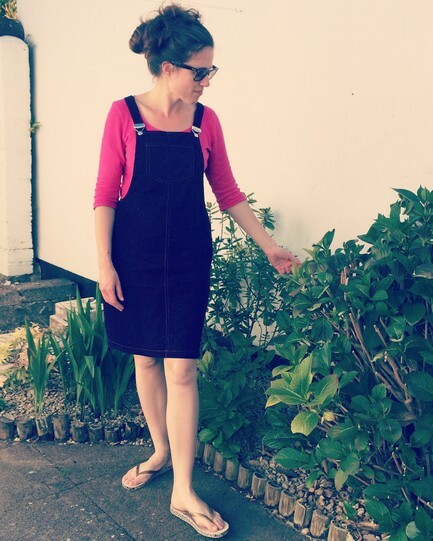 Day 9: A second outing for my Cleo dress and a third for my pink tee! Love this outfit, and have worn these together lots over the last few months. I was glad to discover my needlecord Cleo can work for spring as well as winter. I think the loose fit helps keep it from feeling too hot. 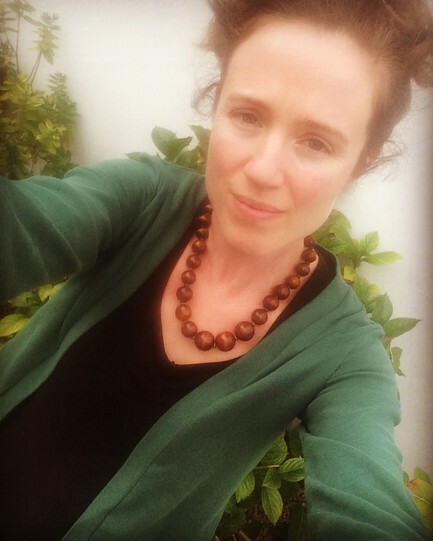 Day 10: A hot, sunny day spent in the garden, so I wore my Knit Sweetheart Top (third time) with my Striped Kimono. Wasn’t sure how much this kimono would fit in with my new style, but I reckon it works pretty well. 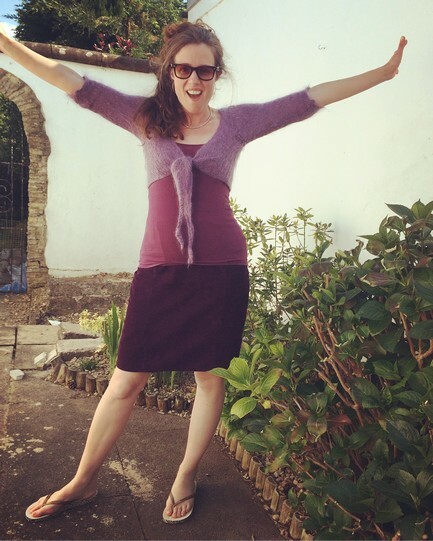 Day 11: Another hot day, but I braved my needlecord skirt (made before I had a blog, but it’s Vogue 8750) with my handknit mohair shrug. I used to think this shrug just didn’t work (too big and too pastel), but I tried dying it over the winter and although it didn’t take too much colour it was enough to make it a stronger shade, and the process felted it just enough to make it fit me properly. This is a perfect layering piece for those spring mornings that are sunny but with a slight chill in the air. I had to take it off once the day had warmed up, but it went back on again in the evening. Day 13: Saturday was a chance to dress up a bit as I took Daisy to see Grease in the afternoon (local theatre production, and it was excellent!) and then went out in Bristol in the evening. 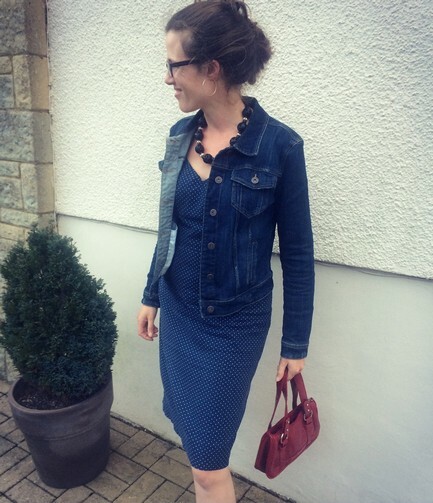 I channelled a bit of a 50s vibe with my Vogue 8280 polka dot dress (made pre-blog), but made it more contemporary with my handmade chunky necklace. The denim jacket and Chucks (out of shot) dressed it all down enough for the pub. I’m really glad to have discovered a way of making this dress more casual, as it means it should get worn more than a couple of times a year. How’s your Me Made May going? And if you’re not taking part, would you be tempted to next year? Thanks! I feel like I’m getting better at planning my sewing these days, but there were quite a few years when I made things in a really haphazard way. I don’t have all that many of those old me-mades these days. They just didn’t suit me. I hear ya! Since doing Wardrobe Architect I’ve been able to catch myself before I buy something totally unnecessary at the fabric store haha Still hard though! 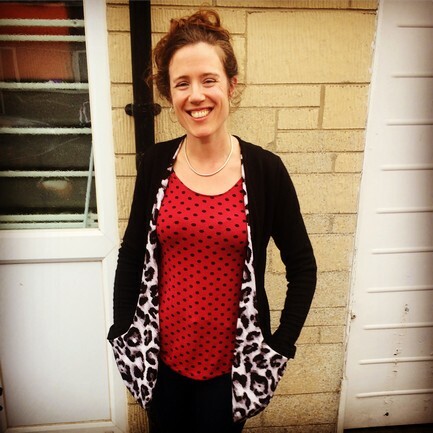 Yeah, I’m finding it easier too… although I’m even more tempted by all things polka dot! Haha Can’t blame you! Polka dots are fun! I really love your sense of style. You look great in your outfits this week. A lovely collection! I took part last year and enjoyed it. I wasn’t sure I could wear a different item every day this year because of my holidays so I didn’t sign up. Maybe next year! That’s true, I could have left out the weeks I was on holiday! Next year for sure! 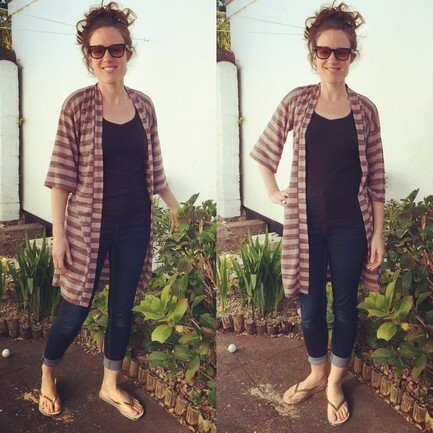 Next Next post: My dream cardigan!